Earlier this year, a 2-cd set titled "Space Metal" was released by STAR ONE. A new band? Well, yes and no. STAR ONE is primarily the new brainchild of Arjen Anthony Lucassen. An extremely talented Dutch multi-instrumentalist who has been around in the music scene for years. His roots, most definitely, are to be found in hardrock and heavy metal. Over twenty years ago he started out with blues/hardrock band Bodine, and continued his carreer in the metal band Vengeance and various other projects. But he wanted more than that and started experimenting with a much more conceptual approach to rock music. 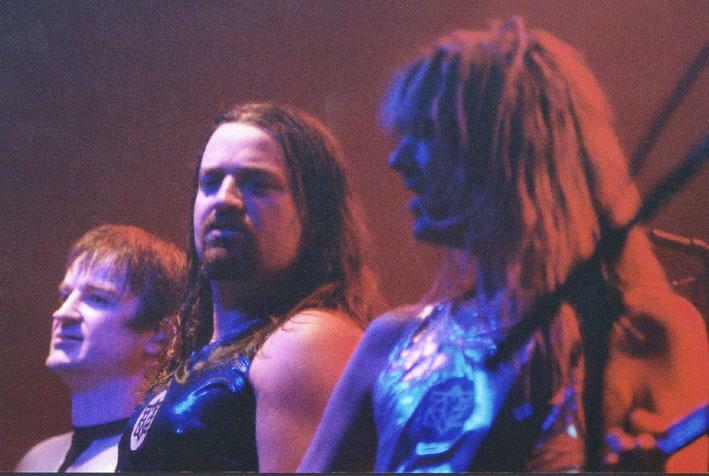 It all lead to the release of "The Final Experiment" by AYREON in 1995. A rock opera based on a continuing story performed by multiple singers, each with their own unique sound and character, and like minded instrumentalists. 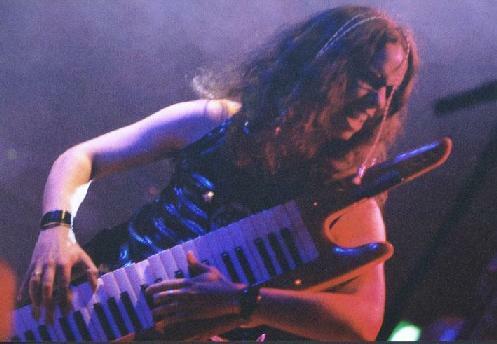 This final experiment happened to be a very successful formula and was followed-up by a series of AYREON rock opera's, individually different in music, style and performers. In 2001, Arjen, who's being called "Ayreon" by everybody and so became the personification of his own projects, released another album. 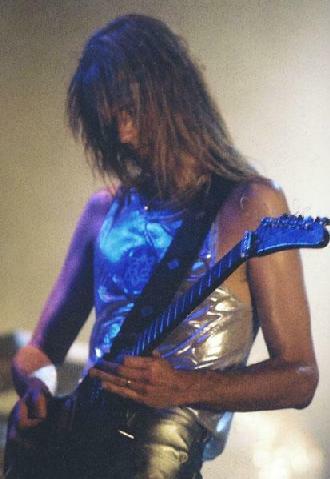 He named the new project "Ambeon", indicating the more ambient character of it compared to other AYREON projects. Another important difference being the fact that he worked with only one female vocalist this time. The talented 14-year old Astrid van der Veen. With STAR ONE, another new Arjen Anthony Lucassen project has been launched. Conceptual, with many contributing artists, like all AYREON albums. But also live on stage as a band this time. Something that hasn't happened to any AYREON project before. A completely new direction? AI: Could you describe briefly what your new STAR ONE project means to you? Ayreon: A welcome change after the electronic "Ambeon" project, let off steam. Computer off, guitar on! AI: The very diverse AYREON cd's you have released so far are all based on a concept that's quite unique for hard rock and metal: stories performed by a group of singers, each with their own character. This concept is also used on "Space Metal". Similar concept but a different project. Why? Ayreon: AYREON stories are always my own stories, and they are continuing stories throughout the cd. On STAR ONE the songs are individual and based on different, existing space movies. Other than that, STAR ONE is a metal project, heavier and more one-sided than AYREON, the music is less layered. Besides, there are only four singers, whereas there is an average of ten on AYREON albums. The songs are also more simply constructed and, thus, easier to play live. STAR ONE was never meant as an AYREON album so it wouldn't have felt good to release it as such, only for commercial reasons. AI: What has inspired you to chose such a conceptual approach to your music after a musical history that's primarily dominated by straight hard rock and metal? Ayreon: It's mainly the first and still the best rock opera ever, Jesus Christ Superstar. From that moment I have always wanted to do something like that myself. But in Bodine and Vengeance that was absolutely out of the question. Also, I have always been fascinated by space and escapism. Bodine and Vengeance were more down-to-earth. Sometimes, I've been able to put a little of that into the music, but just those songs didn't work out really well live. Plus those bands objected to keyboards (that was not done in the narrow-minded eighties), while I adore old analog synths, mellotron and Hammond. But it's hard to stop doing something that's really successful. You never know whether you will be able to reach the same level with a totally different kind of music. Fortunately I succeeded with AYREON and it has become even more successful than all my old bands together! AI: Both AYREON and STAR ONE require a lot from you in musical and organizational respect. Finding the right people for each particular project and actually bringing them together to realize it. Exactly this, you have previously mentioned as a reason for AYREON not to go touring. And yet you'll be on stage pretty soon with a show that must almost have the character of a musical production. Are we facing a change of course here or are we being treated to a unique, one-time rock spectacle? Ayreon: Because it's being presented as "STAR ONE featuring AYREON", it is possible. I'm going to 'cover' AYREON songs, so to speak, with the band STAR ONE. The emphasis, therefore, will be on the heavier AYREON work. For me, playing live is something completely different from recording cd's. When I'm on stage I want to get loud, and when I'm recording I want to capture beautiful melodies and spacy atmospheres. I always explain it like this: metal is in my body and progressive, atmospheric music (Pink Floyd) in my heart. Whether the tour will be a one-time event or not, will become clear after it's done. You know, in time I have really become sort of a hermit who likes to be alone. AI: And what's going to happen with STAR ONE after this tour? Is this meant as a project that will have follow-up or is it a more individual project like "Ambeon"? Ayreon: Originally, it was meant as an individual project, but since it has been so successful there will certainly be a successor. I would also like to record another "Ambeon", but I just don't know when. AI: Knowing you, after this brilliant "Space Metal" cd you will come up with another surprising project performed by the most talented people. Who would you like to collaborate with in the future? Ayreon: I'm already thinking about a new AYREON. I do have a wish list of like fifty people! But unfortunately most of them have passed away (Phil Lynott, John Lennon) or are out of reach (Syd Barrett, David Gilmour). Of course, it is most fun to work with musicians that you've been listening to from your youth. Working with Dave Brock from Hawkwind, therefore, was one of my biggest dreams coming true! 8.30 pm sharp on September the 28th: the lift-off for STAR ONE's "Intergalactic Space Crusaders" European tour from Zoetermeer in the Netherlands. The venue (de Boerderij) was sold out to the very last spot. For months the excited crowd had been waiting for what was about to come. And for a good reason. From the very first chords of "Set Your Controls" you were drawn into an amazing swirl of energy that would last throughout the night, and long thereafter. Almost the complete original STAR ONE crew accompanied AYREON on his visit to Planet Earth. Beside the band, he brought no less than five singers on to the stage! 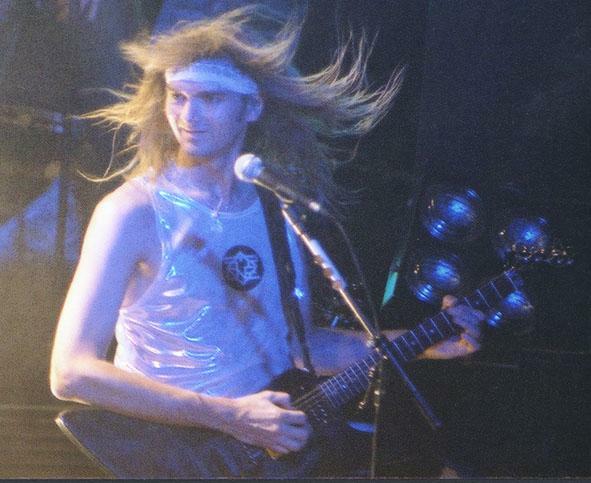 During the show, STAR ONE songs like "High Moon", "Songs of the Ocean" and "Sandrider" were alternated with work from various AYREON projects such as "Dreamtime", from the very first AYREON cd, which was sung beautifully by special guest Edward Reekers (ex-Kayak, and the Future Man from "Into the Electric Castle"), who was one of the 'surprises' of the show. Among other Ayreon songs played, were "Amazing Flight in Space", "Into the Black Hole" and "Valley of the Queens". The performers were tight, really together in both their playing and singing. And obviously having a whole lot of fun doing it. Something that was really amazing considering the short period of time that they had to prepare themselves for the tour. Plus the fact that they are all from different bands. They all got (and took!) their chances and gave the best of themselves while in the spotlight. Whether it was a vocal part by Robert Soeterbroek (Ayreon) on a high platform on the space ship that was the decor. A sparkling guitar solo from the Master, Ayreon, who usually took a modest position on the side of the stage, in favour of his performers. 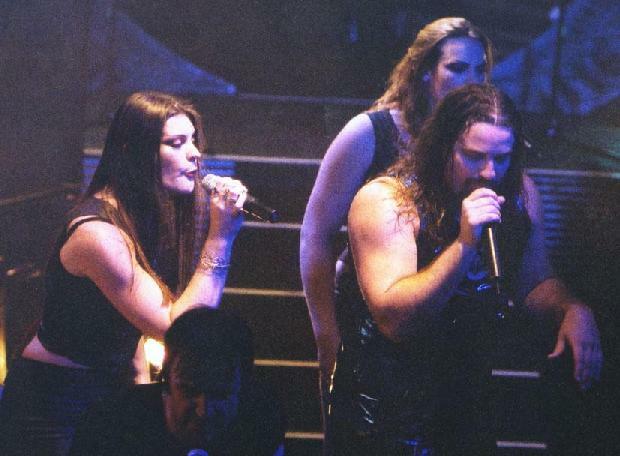 Or the magnificent solo in "The Eye of Ra", sung by Floor Jansen (After Forever, Ayreon), backed up by her sister, Irene. The stage was for everybody, and, at times, the stage was too small! Balance was a keyword that absolutely applies to what was presented here this evening: An overall heavy show, countered by various melodic and acoustic moments. One of the highlights being another(!) guest appearance by the flutist Ewa Albering (ex-Quidam). The brilliant instrumental part of "Isis and Osiris" was truly breathtaking in the show. Balance was also present in other aspects of the show, such as the lighting, the decor (representing a huge space ship), the projection screen and the stage clothes worn by the performers. It all created a spacy atmosphere and made the show a complete event. "Intergalactic Space Crusaders", STAR ONE's "tour song", was something that many people, obviously, had been looking forward to. The crowd sang along as loud as they could, and singers Sir Russel Alan (Symphony-X, Ayreon) and Damian Wilson (ex- Threshold, Ayreon) played their roles excellently, in a vocal combat that greatly enhanced the show. It was hard to decide on a winner since no one was by any means inferior to the other. It was predictable this show would come to an end. But not before we had been exposed to a couple more STAR ONE and AYREON songs: my personal favourite "Star Child" and "The Two Gates". For the performers it was one more opportunity to give away what they had, in full spotlight. The grand finale. At least, that's what we were thinking. But those who thought the party was over now turned out to be terribly wrong as we were finally blown away by Deep Purple's classic "Space Trucking". The whole band was completely freaking out, and singers Damian and Robert were bodysurfing their way through the crowd. An impressive quality live show with the characteristics of a musical production. All within the limits of a mid-size venue! For those of you who didn't have the chance to witness this unique live show you can certainly get a taste of it from the record: STAR ONE, "Space Metal", Released on April 22, 2002 by Inside Out Music. Also available as limited edition digipack with bonus cd.